The Saudi Badminton players who refused to play an Israeli in a recent tournament and their coach have been suspended for 6 months following UK Lawyers for Israel’s representations to the Badminton World Federation (BWF). UK Lawyers for Israel (UKLFI) wrote to the BWF on 23 September, following the incident that occurred at the FZ Forza International Championship in Ukraine on 3 August 2018, when two Saudi Badminton players walked off the court after refusing to play a doubles match with their opponents who were an Israeli and a Ukrainian. The BWF had not been aware of the incident, and thanked UKLFI for bringing the matter to their attention. They said “We consider such incidents as serious and want to ensure that they are properly addressed within BWF’s regulatory framework”. The BWF told UKLFI that following receipt of their letter, they requested the referee report from the tournament organisers, along with explanations from the players and the coach, via the Saudi Badminton Committee. 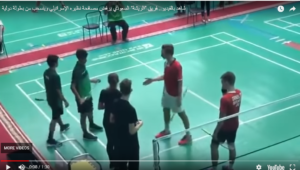 At the instigation of the BWF, the Saudi Badminton Committee investigated the incident and has found the players and coach guilty of breaching their code of ethics. It has imposed a six month suspension from participating in local or international tournaments from 1 October 2018. The BWF has reviewed the sanction and has found it to be “adequate considering the circumstances of the case”. The BWF has now written to the Saudis urging them to ensure that all their players are aware of and abide by their own internal code of ethics and behaviour, as well as the BWF codes of conduct. Their letter to the Saudi Badminton Committee said: “We are satisfied with the investigation and actions your federation has taken regarding this incident, but we ask that moving forward your federation endeavours to ensure that all its players, coaches and team leadership are aware and abide by your internal code of Ethics and Behaviour and the BWF Codes of Conduct”. Sam Green, Turner, director of UK Lawyers for Israel said: “We are delighted that the Badminton World Federation has recognised that discrimination against Israelis must not be tolerated. We welcome the message this sends to other sporting authorities of the need to take action to prevent such disgraceful behaviour in the future”.